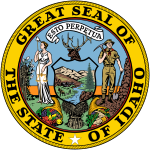 The 1980 United States presidential election in Idaho took place on November 4, 1980. All fifty states and The District of Columbia were part of the 1980 United States presidential election. Idaho voters chose four electors to the Electoral College, who voted for president and vice president. Idaho was won by former California Governor Ronald Reagan (R) by a 41-point landslide. It is a reliably Republican state, and the last Democratic presidential candidate to carry the state was Lyndon Johnson in his 1964 presidential campaign, and even Johnson won by merely five thousand votes in a national landslide. With 66.46% of the popular vote, Idaho would prove to be Reagan's second strongest state after Utah. ^ "1980 Presidential General Election Results - Idaho". uselectionatlas.org. Retrieved May 24, 2015. ^ "A super guide for Super Tuesday". CNN. February 4, 2008. Retrieved May 24, 2015. ^ "1980 Presidential Election Statistics". Dave Leip’s Atlas of U.S. Presidential Elections. Retrieved 2018-03-05. ^ "1980 Presidential General Election Results – Idaho". Retrieved 2017-12-29. This page was last edited on 31 December 2018, at 03:06 (UTC).